Years ago in Atlanta for a conference I had the opportunity to take an evening walk downtown. Almost as soon as I got started I was approached by a man who offered to be my "homeless guide". He explained that panhandling (my word) was against the law and strenuously prosecuted but providing a tour guide experience for a tip was permitted. I have no idea how close to the actual Atlanta by-law his explanation was, but I do know this: I admired his entrepreneurial spirit, and the couple of hours we spent walking and talking were some of the most enjoyable I have ever spent in conversation. His view on life was different and enlightening on so many levels. We argued politics and who was to blame for his situation, and conceded that both social and personal culpability have a part to play in homelessness. At the end of the tour we shook hands, I tipped him well for his hospitality and I went on my way. In London, England organized tours given by homeless people to convention delegates called Unseen Tours are a reminder to those of us in the conference and hotel industry are in the people business – not just the "people who can afford the hors d'oeuvres and conference rates" business. We need more of this, in more places, and more often. "How is that you, a Jew, ask a drink of me, a woman of Samaria? (Jews do not share things in common with Samaritans)"
Many years ago when I was in the restaurant business in Toronto I made the mistake of nearly throwing out a man who came for a meal, even before he ever made it inside. He was unsteady on his feet, had wild hair, big glasses (it was the early eighties) and a rust coloured corduroy jacket of which I wasn’t very fond. He looked like trouble to me; he might have been drinking, he might be unable to pay for his meal, either way he wasn’t going to cause trouble in my restaurant. Until I spent a few minutes getting to know him at the door, I had no intention of letting him enter – I planned to invite him to leave even before he was seated! In the end I was glad I didn’t do any of that, and the man came in, enjoyed a meal and paid for it in full. I bade him farewell and wished him luck in his performance. 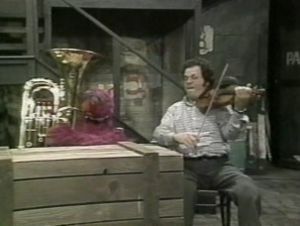 I later learned (through the power of Sesame Street) that he was a world renowned violin virtuoso in town for an evening with the Toronto symphony. His unsteady gait, far from being a result of over consumption of alcohol, was in fact because of a bout of polio he had suffered as a child. This is not just a story about how I met Itzak Perlman and didn’t realize it, or a lesson learned about judging people on appearance, although it is both of those. This is a story of reconciliation, and a personal experience with Christ, which for the Samaritan woman in the Gospel happened at Jacob’s well. Jewish, Christian, and Muslim traditions all associate the well with Jacob, and so it is a place of religious significance, and perhaps no coincidence that Jesus would welcome the Gentiles into the faith (through a conversation with a Samaritan woman) at that very spot. The Samaritan woman judged Jesus on first impressions alone. He was different, a Jew. How she knew that the Gospel doesn’t indicate: perhaps his manner of dress, or accent or his choice of words gave him away. Perhaps because she didn’t know him to be a Samaritan she deduced he must be a Jew. However she arrived at the conclusion, she decided she shouldn’t be speaking to a man in public, and certainly not a man who was a Jew. We judge people by their appearance and get it right just enough times that it is a hard habit to break. Even getting it right is not a good enough reason to use our intuition and preconceived notions as the sole measure by which another person is valued, even less so when we get it horribly wrong, as I nearly did with Mr. Perlman and I’m sorry to report, certainly others since. The woman at the well was received and heard, and learned the mercy of God. We too, through the Sacrament of Reconciliation draw into a closer, and personal relationship with Christ. When we confess, do penance and are forgiven, we reconcile with God and can truly unite with his body in the Sacrament of the Eucharist. Why Does God Hate Toyota? He doesn't. For starters, let's get that out of the way. People of faith can agree, without pretending to know the mind of God, that He doesn't hate Toyota or Japan, or any other country or company, any group of people, faith, association or individual. How do we know? Because He tells us so. Japan has suffered through an earthquake, a tsunami, the rising risk of nuclear meltdown, and now an economy on the edge of ruin. Just last year Toyota's sales crawled to a halt as the company operated under the cloud of suspicion; had they deliberately mislead or dodged dangerous mechanical situations? And now production of Toyota automobiles around the world is threatened by a lack of parts from a crippled Japanese economy. People of faith pray for the people of Japan at this time. God doesn't exact revenge in this manner, or at all, nor is there any reason to suspect one country or company would be singled out in this way. We, humankind, has been given the gift of free will. We can build on fault lines, we can build nuclear plants on fault lines if we want. We can settle below sea level in Louisiana and the Netherlands, if we are inclined. The ruling class can clear cut trees from the mountain sides of Haiti so that when earthquakes rock and rains fall, there will be nothing to hold back the mud to wipe out the shanty towns of poor Haitians. We can blame God if we want to, or ask ourselves how a just God could let this happen. God is love. God gives us the means to help each other. God gives us enough food that no one should go hungry, God gives us the wherewithal to build safely at great expense, or not at all. In spite of all this, God gives us a planet that sometimes behaves in a way that can harm us, and as we know from scripture, God makes the sun shine and the rain fall on all of us, equally. Sometimes, even when we get it right, nature exacts a terrible toll on the innocent and unsuspecting. There is no deserving, or not deserving any of it based on our works of good or evil, or on our faith or lack of faith. And there, because of the grace of God, go all of us. These days companies are seeing more and more departments as revenue producing, and viewing most employees within their organizations as sales people. Departments whose goals in regards to the P&L were once only to keep costs in line, are now expected to increase revenue. This is done by upselling and by referrals to the sales team. This is a good thing, if done with excellence and superior customer service as the goal. A great customer oriented service advisor does not merely act as an order-taker, but as a trusted and expert advisor in the customer experience. She suggests products or service that will enhance the customer's enjoyment of the product; for example - a service department in an automobile dealership might suggest a fluid change because, and only because the performance of the automobile will be improved, or because, and only because, it is needed. The extra service will add revenue to the dealership's income line, but that MUST NOT be the sole reason for suggesting add-on services or products. The same goes for appetizers and desserts in restaurants - suggested by professional servers to enhance the guest experience, not just to pad the bill. It applies to hotel front desk clerks - upgrades to premium rooms to enhance the guest experience based on information gleaned at the reservation or check-in. An astute representative will determine what is the purpose of the visit. If it is to celebrate an anniversary, for example, an upgraded room for a few extra bucks might make this a memorable weekend for the couple (and make the husband who booked the hotel look like a superstar in the eyes of his adoring wife). It applies to the service department in your company, whatever your product or service. The flip side of the company's representative's failure to fully engage is a client who never experiences the best they have to offer for the price, or fails to get the service he needs. "They didn't ask for it," is the telltale excuse of the order-taker, as though the customer is supposed to be the expert. "It was OK," is the telltale appraisal of the customer experience. OK, but not memorably good or bad. Clearly, the optimum is a fully informed customer interaction with an empathetic expert that may result in increased revenue for the company, and will definitely result in increased satisfaction and repeat business and referrals (loyalty). That requires a commitment to excellence from the top and a clearly defined statement of intent, something frequently lacking in today's business environment. Those who get it right make money. Those who don't scramble for every penny they can filch out of the unsuspecting client's wallet. Recently in our city a cop was "caught" playing video games in his cruiser, with pictures to prove it. Not long ago pictures of a sleeping transit worker in Toronto were splashed across the front pages. Our cell phones and smart phones are always at the ready to catch others in the act of offending our sense of what they should be doing instead. The transit union protested that instead of snapping a picture of the sleeping booth attendant, the judgmental picture taker should have checked to see if he was in any sort of distress. It turned out to be prescient, as I am told by a someone in the know that the transit worker died not long after that picture was snapped. It may or may not be related to what caused him to be sleeping on the job, and who cares? Have we become a society that is quick to broadcast other's faults through social media? In both these cases the pictures and story were picked up by the mainstream media, and the community tsk-tsk'd in shame. Ironically, in our privacy obsessed times, a man's illness or death cannot be announced from the pulpit, nor prayers requested of the congregation, without the express permission of the family. So, if I have a heart attack and slump over on a park bench later today, feel free to take a picture of the sleeping drunk and post it on the web. Do not, however, do anything to help and for God's sake, don't say my name in church. I need my privacy. The Steve Report...Making Sense of Business Events: Everything I’ve Learned About LinkedIn (so far): "Over the past six weeks I’ve learned a lot about LinkedIn; reading articles, attending webinars and in general just playing and experimentin..."